Shareholders of four Lotte companies approved a plan to set up a holding company Tuesday, in a move that is expected to tighten the grip of Chairman Shin Dong-bin as the group faces increasing internal and external difficulties. 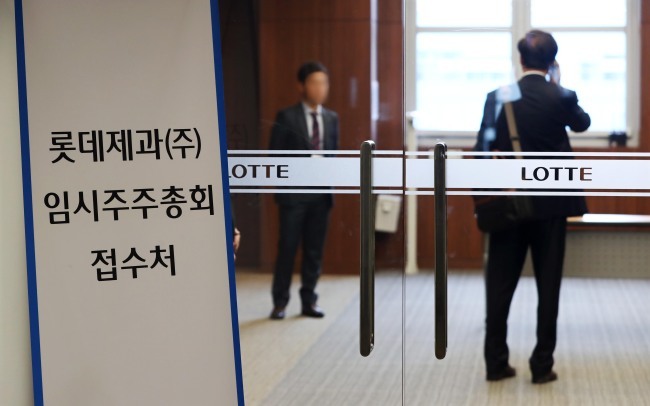 Lotte Confectionery, Lotte Shopping, Lotte Chilsung Beverage and Lotte Food held respective shareholder meetings Tuesday morning to vote on merging the four companies’ investment entities into one holding company. All four companies agreed to the plan, with 86.5 percent, 82.2 percent, 88.6 percent, and 91 percent of the vote, respectively, according to Lotte Group. The plan had been vehemently opposed by Shin Dong-joo, the brother of the current Chairman Shin Dong-bin, and small shareholders, who had argued the move would pass on the risks of the ailing Lotte Shopping to the three affiliates. Under the new structure, which will take effect on Oct. 1, the four companies will divide into investment and business entities, then merge the investment entities into a single holding company. Trading on shares of the four affiliate companies will resume on Oct. 30. “This (holding) company will be tasked with business management evaluation and support and brand license management to increase Lotte’s company value,” the group said in a statement. The new holding company is expected to seek to merge with Hotel Lotte, the current de facto holding firm of the business group. The move would give Shin Dong-bin a controlling stake. Shin Dong-bin is most likely to become the largest shareholder of some 10 to 20 percent of shares by making an investment in return for new shares issued by the company. Since 2015, Lotte Group has been pursuing the transition to a holding company structure, which it said would increase transparency in the company. After Chairman Shin Dong-bin gained sole power over the group, pushing out his father Shin Kyuk-ho and brother Shin Dong-joo, he had signaled at a sweeping restructuring of management. The company explained that the holding company structure would eliminate most of the circular holding ties between Lotte’s affiliate companies, which had come under criticism. “Lotte’s 416 circular holdings in 2015 has been reduced to 67 to date, and the new holding company will reduce those holdings further to 18,” the group said. The 18 includes 12 new circular holdings and six mutual investments created by the merger, which must all be eliminated within six months according to current fair trade law. Industry analysts placed the value of the holding company to be approximately 4 trillion won ($3.55 billion). Jeong Dae-ro, an analyst with Mirae Asset Daewoo, said that the aggregate value of the four affiliates could rise between 0.4 percent and 5.6 percent after the merger. Shin Dong-bin currently faces trials on corruption allegations along with his father. He has also been indicted for his alleged involvement in a bribery scandal that led to the impeachment of former President Park Geun-hye. Lotte, meanwhile, has also been dealt a serious blow to its business due to apparent economic retaliation by China -- the source of one of its largest pool of customers -- over the deployment of a US missile defense system here at its former golf site in Seongju, North Gyeongsang Province.